In 1893 a photo paper factory was founded in Cologne, Germany. After several financial failures this company was bought by the "Rheinische Emulsions-Papierfabrik Heinrich Stolle". A blooming mimosa twig was the company's symbol. In 1902 it was merged with Dr. Opitz & Co., Munich, becoming a stock market company. It moved to Dresden in 1904, successfully making photo paper and dry plates there. The company was renamed "Mimosa AG" in 1913. Before and after WWI it bought several other companies. From 1905 to 1930 its production of photo paper rose from 25,000 square metres to 7,310,000 square metres. Other film products were also made by the company. In the era of the Nazi Third Reich the company's Jewish employees, including most of the directors, were forced to leave; the owners of the company then appointed Dr. Weidner and Mr. von der Osten new directors. During WWII more than half of the production was changed to war relevant material, and the factory director von Dobschinsky was sent to a concentration camp. Even though during the Destruction of Dresden the factory had not been bombed severely, Dr. Weidner and Mr. von der Osten, in fear of the incoming Russian soldiers, had already moved assets of the company to the western part of Germany trying to re-establish the company's base in Hamburg. In late 1945 the Russian occupying forces fired both managers (who had left in Dresden in May 1945). The Soviet government of East Germany allowed Mimosa to restart photo paper production with Mr. von Dobschinsky again in the lead and, once the company became state owned, with von Dobschinsky as custodian. In 1949 the company became "VEB Mimosa Dresden". Between 1946 and 1950 Mimosa produced the shutters Velax and Corona mainly for its own camera production. That part of the factory was taken over by Zeiss Ikon in 1950. In 1947 the company was directed to make cameras. This became a successful project, lead by Robert Graichen. The Mimosa (1948) and later the Mimosa II (1949) were very compact full-featured 35mm viewfinder cameras. From 1954 to 1990 the company continued solely with the production of photo paper, the other product lines being taken over by Zeiss Ikon. German reunification brought the end for the company. 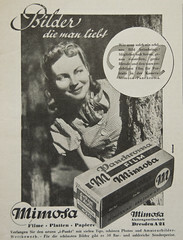 In West Germany a new photo paper and film factory "Mimosa AG" was launched in 1948. It moved from Hamburg to Hannover and from there to Kiel. Several lawsuits were fought with the East German "VEB Mimosa". The actual state of that company is unknown. Dr. Weidner and Mr. von der Osten meanwhile founded a new company "CAWO Photochemisches Werk GmbH" in 1947 with employees from the former Mimosa producing first photo papers and film then switching over to the field of medical x-ray. CAWO is now a world-wide renowned name in radiography. This page was last edited on 9 February 2018, at 11:36.